Apple's iPhone 8 will undoubtedly be touted as "the best iPhone we've ever made" by Tim Cook in September, and Samsung will claim the same for the Galaxy S8 on March 29. But one feature both phones will lack is a dual-SIM card slot, according to major carrier and phone manufacturer sources who've talked exclusively to TechRadar. Why is that? Why can't the best phones come with this highly beneficial, money-saving feature for international travelers? Aren’t these phones supposed have all the bells and whistles? “The truth is, carriers make too much money off of international plans,” said one US carrier rep who spoke to TechRadar at MWC 2017. In other words, it's not the greed of Apple and Samsung, but of the networks that deliver their phones to customers – and even the leading phone manufacturers need to kowtow to major carriers. If you have two SIM slots, you can use your regular, everyday phone number for calls and texts in the first slot while abroad, and reserve the second slot for data from a local SIM card. Local carriers (wherever you're visiting) charge much lower prices, and can provide 4G LTE speeds, so you can avoid outrageous international data fees with your home carrier while abroad. 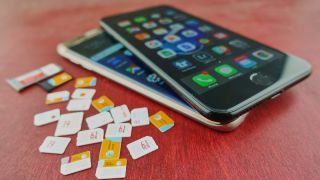 But with just one SIM card slot you have decide between paying for an expensive international plan, or completely switching over to a local carrier, which changes your regular phone number. Goodbye, iMessages. Hello, confusing +86 country code when visiting China and texting friends. All of this complicates calls, texts and WhatsApp messaging, too. You’re either cutting into your travel budget or cutting yourself off from your normal number. Sure enough, the prices for international plans in the US have you paying through the nose on most carriers. It’s price gouging at its finest. You'll get just 200MB for $40 (about £33, AU$53) for AT&T's basic international plan – and you can burn through that by checking your attachment-laced email. “How many paperclip attachment icons was that in a row? [Expletive]!” you’ll say nervously. Forget streaming music or video. Pay $60 (about £50, AU$80) and AT&T bumps that all the way up to 300MB. Note: that’s not an extra 300MB – that’s 100MB extra for a total of 300MB. Woah, you're a big-yime data user now! It’s $120 (about £98, AU$158) for 800MB. Not even 1GB. And what happens if you go over? It’s anywhere from 15 to 25 cents for every single extra MB. Going over can be a costly mistake. Verizon is hardly any better. For every 100MB it’s $25 (about £20, AU$33), and if you want unlimited received texts (with just 100 outgoing texts) it’s $40 (about £33, AU$53). Sprint and T-Mobile’s free global roaming perks are better, but still not what you want when traveling internationally, and they don’t obviate the need for a dual-SIM phone. They only give you free data at 2G speeds, and they charge premiums for 3G. Sprint’s 3G international pass for 100MB is $15 (about £12, AU$20), which expires after 24 hours. 200MB is $25 (about £20, AU$33), expiring after seven days, while 500MB costs $50 (about £41, AU$66) and expires after 14 days. T-Mobile is the best option of the four major US carriers, charging $25 a month for what it calls T-Mobile ONE+. This extends your unlimited data internationally, with lower-end 3G speeds of 256kbps. You can at least get where you’re going in a foreign city in Maps. Google’s Project Fi has reasonable data prices: $10 for every 1GB (on top of $20 for unlimited domestic talk and worldwide texts), and you can get a refund on unused GBs. Project Fi doesn’t cap you at 2G or 3G speeds; it’s whatever speeds are available to Google’s partners – T-Mobile, Sprint, US Cellular and Three. The catch? It only works on phones like the Google Pixel, Pixel XL, Nexus 6P and Nexus 5X. Both AT&T and Verizon now offer an International Day Pass (AT&T) and TravelPass (Verizon) to compete with T-Mobile and Fi. They’re charging $10 per day (about £8, AU$13), and it only counts against your domestic plan’s normal data allotment. But, of course, we’ve found out the hard way in Barcelona that they don’t work on all data plans, and have restrictions buried the FAQ pages, hidden from the glossy webpage that’s meant to sell you the passes. If you’re grandfathered-in on AT&T’s old Unlimited Plan, it just won’t work. 'If you're on the new Verizon Plan Unlimited, 4G data speeds apply for the first 500 MB/day with reduced speeds thereafter,' reads the small print. In other words, get ready for 2G speeds thereafter. AT&T has the same policy on its new unlimited plans. So what do these expensive data plans have to do with the design of your phone? You’re not getting a dual-SIM flagship device in the US, UK, or many other countries because of them. It actually changes the fundamental makeup of your phone. Take the unlocked ZTE Axon Mini, for example. When we reviewed it in the US and UK, it was a dual-SIM phone. Great. When the same phone launched in Canada, however, it was sold through Virgin Mobile on a two-year contract. All of a sudden the microSD/second SIM slot only worked for microSD expandable storage, not a second SIM. A carrier went out of its way to break a feature on a phone. That’s how powerful carriers are... in Canada. That’s not the case in the Middle East, Africa and Asia, where phones are sold unlocked without carrier interference. In these regions, you can buy a dual-SIM Samsung Galaxy S7 Edge. Not only will you never see a dual-SIM Galaxy or iPhone in the West, you can’t get an unlocked single-SIM Samsung Galaxy phone at launch in the US. It takes about four months for Samsung to make its new phones available unlocked, giving carriers a gigantic head start. In the US, we’re told there’s even more control and pressure from carriers – and that all of this is designed to make you pay more every time you travel. “As long as carriers have the upper hand, it’ll always be that way,” we were told by one phone manufacturer rep – who wished to remain anonymous – days after MWC. Apple is the more likely change agent. Its carrier-agonistic Apple SIM in the iPad Pro Wi-Fi + Cellular models could be make dual SIM a software fix one day without taking up any extra space. But while Apple was able to forgo having carriers stamp their gaudy logos on the iPhone and insert their needless apps (bloatware) into iOS, a dual-SIM iPhone 8 is one feature you shouldn’t hold your breath for. And now we know why.